Tropical Depression 15W appeared ill-defined on NASA satellite imagery on July 23. 15W formed on July 22 and the next day NASA's Aqua satellite captured an image of the storm. 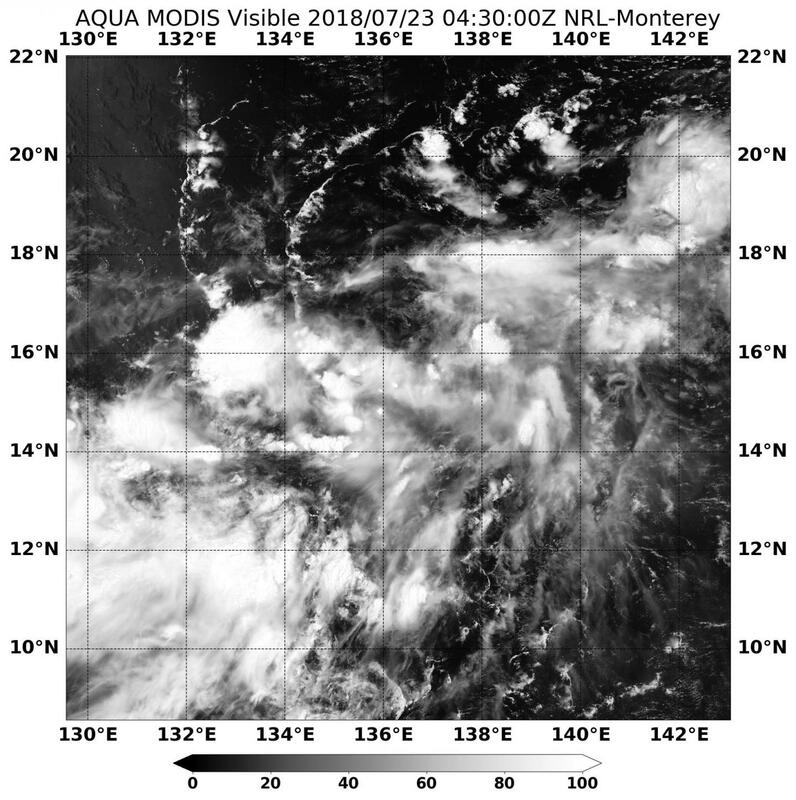 The Moderate Resolution Imaging Spectroradiometer or MODIS instrument aboard NASA's Aqua satellite caught a visible light image of Tropical Depression 15W on July 23 at 12:30 a.m. EDT (0430 UTC). The MODIS image showed fragmented thunderstorms around an elongated low-level center that was somewhat difficult to pinpoint on visible imagery. Despite the disorganized appearance, the depression continues to consolidate. At 11 a.m. EDT (1500 UTC) the Joint Typhoon Warning Center or JTWC noted that Tropical Depression 15W had maximum sustained winds near 30 knots (34.5 mph/55.5 kph). It was located near 16.7 degrees north latitude and 137.0 degrees east longitude, about 416 nautical miles north-northwest of Ulithi. 15W has tracked northward at 6 knots (7 mph/11 kph). The JTWC forecast calls for 15W to move to the northeast and strengthen over the open waters of the Northwestern Pacific Ocean. JTWC is forecasting 15W will move just north of Iwo To Island, Japan on July 27.